USAGE GUIDELINES: 1 sachet to be mixed into food or liquid, 1 to 2 times per day. Children are particularly susceptible to disruptions to the delicate balance of the “good” and “bad” bacteria in their tummies. 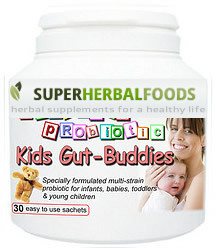 Kids Gut-Buddies is a unique children’s probiotic powder that contains 7 strains of naturally-occurring beneficial organisms, including the child- specific Bifidobacterium infantis strain. It is designed to help restore healthy levels of intestinal flora after a course of antibiotics or following a digestive upset. It can also offer immunity support when babies, toddlers or young children return to playgroups or preschool and germs and viruses can be prevalent. Suitable for babies and young children. Probiotics: robiotics are “friendly” bacteria that help to maintain the natural balance of organisms (microflora) in the intestines. They do this by competing for space and nutrients with harmful organisms that can make people sick; these beneficial micro-organisms also help to keep any pathogens present in check and work to prevent overgrowth that could lead to disease. The world is full of micro-organisms and so are our bodies - in and on the skin, in the gut, and in other orifices. Friendly bacteria are crucial to the proper development of the immune system, to protection against micro-organisms that could cause disease and to the digestion and absorption of food and nutrients. Each person's mix of bacteria varies, but interactions between a person and the micro-organisms in their body, and among the micro-organisms themselves, can be crucial to their health and well-being. Children are particularly susceptible to disruptions to the delicate balance of good and bad bacteria. Most probiotics are bacteria similar to those naturally found in the gut, especially in those of breastfed infants (who have natural protection against many diseases). The micro-organisms contained within Kids Gut-Buddies occur naturally in the gut of children. Prebiotics: Probiotics are not the same thing as prebiotics. Prebiotics are non-digestible food ingredients that selectively stimulate the growth and/or activity of beneficial micro-organisms already in people's colons. In other words, they encourage the growth of beneficial bacteria - you can think of prebiotics as food for probiotics. While probiotics are living micro-organisms, prebiotics are non-living. When probiotics and prebiotics are mixed together, they form a synbiotic. Fructooligosaccharide (FOS) has been a popular dietary supplement in Japan for many years and is now becoming increasingly popular in Western cultures for its prebiotic effects. FOS serves as a substrate for microflora in the large intestine, increasing the overall gastrointestinal tract health. It is also used as a supplement for preventing yeast infections. Several studies have found that FOS promotes calcium absorption in the human gut. The intestinal microflora in the lower gut can ferment FOS, which results in a reduced pH. Calcium is more soluble in acid, and, therefore, more of it comes out of food and is available to move from the gut into the bloodstream. FOS can be considered a small dietary fibre with (like all types of fibre) low caloric value. Antibiotics kill friendly bacteria in the gut along with unfriendly bacteria. Probiotics are often used to offset side effects from antibiotics (like gas, cramping and diarrhea). AAD results from an imbalance in the colonic microbiota caused by antibiotic therapy. Probiotic treatment can reduce the incidence and severity of AAD. There are cells in the digestive tract connected with the immune system. One theory is that if you alter the micro-organisms in a person's intestinal tract (e.g. by introducing probiotic bacteria), you can affect the immune system's defences. A 2010 study suggested that the anecdotal benefits of probiotic therapies as beneficial for preventing secondary infections, a common complication of antibiotic therapy, may be because keeping the immune system primed by eating foods enhanced with "good" bacteria may help counteract the negative effects of sickness and antibiotics. It was thought that antibiotics may turn the immune system "off" while probiotics turns it back on "idle", and more able to quickly react to new infections. LAB foods and supplements have been shown to aid in the treatment and prevention of acute diarrhea and in decreasing the severity and duration of rotavirus infections in children and travellers' diarrhea in adults. Probiotic lactobacilli can help to correct malabsorption of trace minerals, found particularly in those with diets high in phytate content from whole grains, nuts and legumes. Lactic acid bacteria (LAB) supplements have been found to modulate inflammatory and hypersensitivity responses. Clinical studies suggest that they can prevent recurrences of inflammatory bowel disease in adults, as well as improve milk allergies. Studies have demonstrated the effectiveness of a range of LAB in lowering serum cholesterol levels, presumably by breaking down bile in the gut, thus inhibiting its re-absorption (which enters the blood as cholesterol). Clinical trials have indicated that consumption of milk fermented with various strains of LAB may result in reductions in blood pressure. It is thought that this is due to the ACE inhibitor-like peptides produced during fermentation. Certain probiotics have been found to improve symptoms of IBS and to be safe in treating ulcerative colitis. NO ADDED: sugar, salt, preservative, wheat, gluten, lactose, dairy, colours, fillers or flavours.